Set apart from the daily activities of the household, the parlor was reserved for specific social functions — meeting with the local clergyman, entertaining friends and neighbors, wedding parties, or funerals. 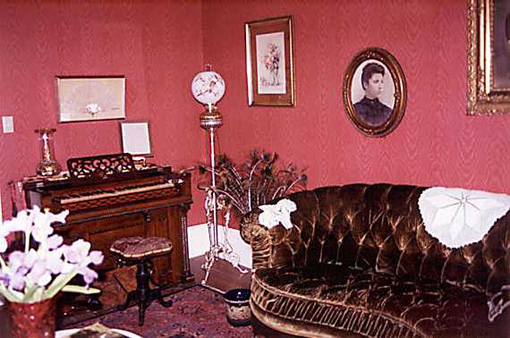 The parlor is named for one of the Buehl daughters who donated her portion of the purchase price back to the Society, helping us reach our goal in 1976. The parlor houses wonderful antiques of the Mid-Victorian period. Everything is authentic except for the reproduction of the carpet.